Chelsea’s 100 per cent record in the Premier League was ended by West Ham United in a 0-0 draw on Super Sunday. 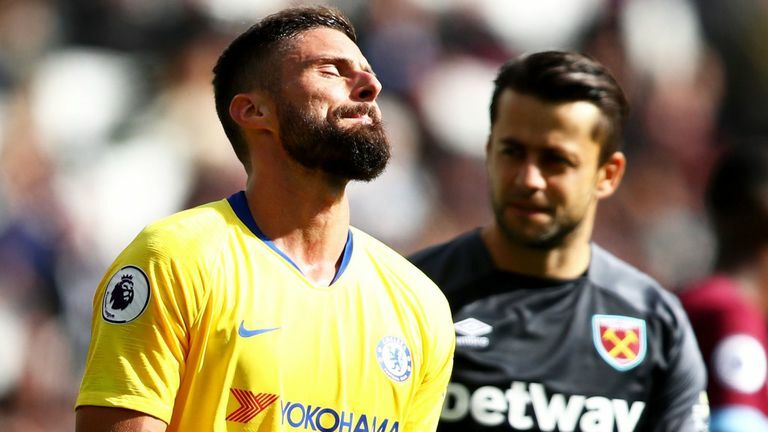 After winning their first five games under Maurizio Sarri, Chelsea's quality in the final third was severely lacking as Eden Hazard was suffocated by the Hammers' midfield. West Ham created clear chances but missed the ruthlessness of Marko Arnautovic, who was absent with a knee injury. The standout opportunity fell to Andriy Yarmolenko late on but he headed wide from six yards out. 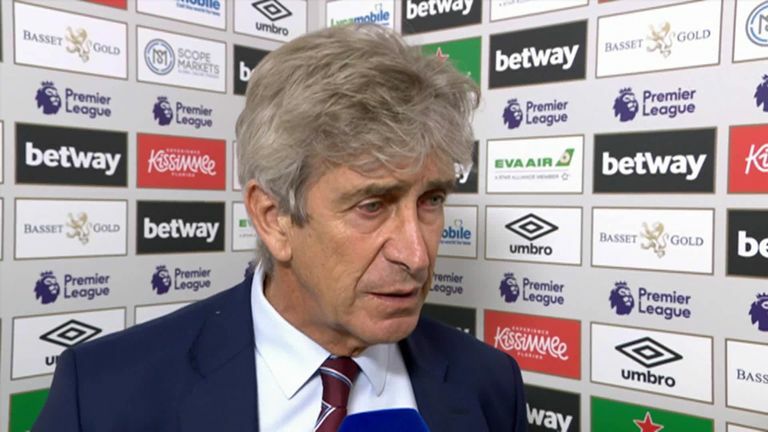 Questions were being asked about West Ham under Manuel Pellegrini after four straight defeats, but four points in the last week and a first clean sheet has them moving in the right direction. 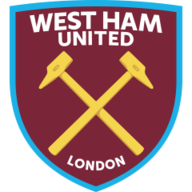 West Ham: Fabianski (7), Balbuena (7), Zabaleta (7), Diop (6), Masuaku (7), Rice (7), Obiang (6), Noble (7), Yarmolenko (6), Anderson (7), Antonio (5). Chelsea: Arrizabalaga (7), Rudiger (6), Alonso (6), Luiz (6), Azpilicueta (6), Jorginho (6), Kante (5), Kovacic (5), Willian (6), Hazard (5), Giroud (5). Despite bossing the ball in the early stages, Chelsea - who had made a midweek trip to Greece in the Europa League - created little as West Ham carried the bigger threat on the counter attack. Arnautovic's replacement, Michail Antonio, squandered two chances in quick succession, blazing over from a tight angle on 31 minutes before firing straight at Kepa Arrizabalaga two minutes later. Marko Arnautovic failed a fitness test for West Ham, therefore Michail Antonio started up front on his own. Meanwhile, Olivier Giroud was preferred to Alvaro Morata while Willian replaced the injured Pedro. David Luiz headed a great opportunity over the bar just after the break as Chelsea continued to look pretty with the ball but lacked ideas in the final third, with the axis of Hazard, Olivier Giroud and Willian struggling to find much rhythm. Alvaro Morata replaced Giroud on 64 minutes and should have scored within two minutes of coming on. Luiz took advantage of some sloppy defending from Yarmolenko at the back post but Morata's close range finish smacked Lukasz Fabianski's face and flew to safety. Hazard should have been greedier when bursting into the box with 15 minutes left, deciding to look for Morata rather than shoot before Yarmolenko wasted a glorious opening. Robert Snodgrass curled over a wonderful cross that put the chance on a plate for the Ukrainian, but he somehow headed wide from six yards out. Ross Barkley tested Fabianski from range in stoppage time and Willian fired wide from a tight angle but a Chelsea winner never really looked likely as they failed to score in the Premier League for the first time under Sarri. West Ham have avoided defeat in three consecutive Premier League games against Chelsea (W1 D2) for the first time since a run of five between March 1998 and March 2000. Chelsea failed to score in the Premier League for the first time under Maurizio Sarri and for just the second time in their last 15 league games (also a 3-0 defeat at Newcastle in May). This was only Chelsea's second goalless draw in their last 48 away Premier League games (also 0-0 against Everton in December 2017). Chelsea midfielder Jorginho attempted 180 passes in this match - since 2003/04, this is the most by a player in a single Premier League match. Jorginho has completed 628 passes in total for Chelsea in the Premier League this season, more than any other player. This was Chelsea's 600th top-flight London derby, becoming the third London side to reach this number after Arsenal (674) and Spurs (609). Any one of the West Ham defensive unit would have been good value for the award but Zabaleta edges it courtesy of some important last-ditch tackles in the box. The former Manchester City man may be lacking pace but his positional play is still of high standard, with Hazard getting no joy from Zabaleta when moving out to the left flank. "We created two key chances with Michail Antonio and Andriy Yarmolenko. They had one clear chance that Alvaro Morata's missed after the rebound. 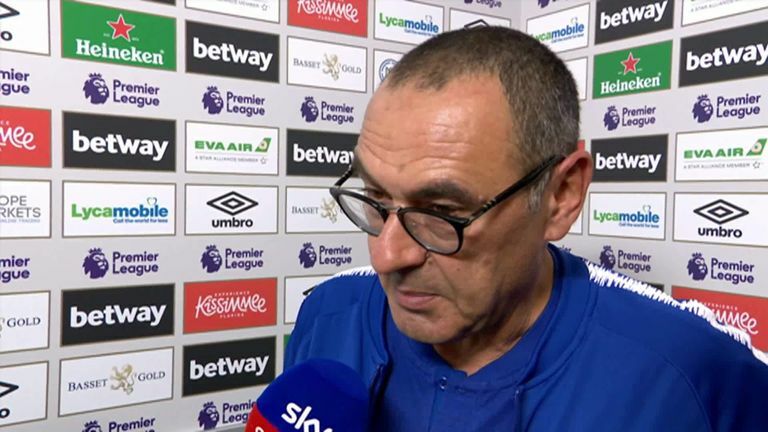 I think we played a good tactical game as we allowed them to have the ball but near our box we defended well and we got our first clean sheet." "We could have done better, especially in the last 20 minutes of the first half. We played very well in the last 20 minutes. We knew West Ham are a good team and today would be very difficult. We are not happy with the result." 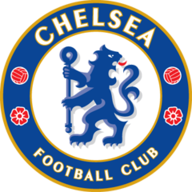 Chelsea travel to Anfield on Wednesday to play Liverpool in the Carabao Cup third round - live on Sky Sports - before welcoming Jurgen Klopp's side to Stamford Bridge next Saturday. Meanwhile, West Ham play Macclesfield on Wednesday in the cup before hosting Manchester United next Saturday lunchtime.